Apteco is an owner-run company that develops software for the analysis of marketing data and the automation of marketing campaigns. Apteco´s FastStats® software provides marketers with additional knowledge about their data. The company´s portfolio includes marketing solutions for customer segmentation, data mining, forecasting models, customer profiling, multichannel campaign management and reporting capabilities. Thanks to Apteco´s international sales partner network, more than 500 FastStats® installations are operating on the desktops of nearly 3,700 users worldwide, 500 of which are campaign managers, distributed over 100 systems. Apteco customers include Fitness First, DER Touristik, RTL interactive, Travian Games, K & L Ruppert, Weltbild, gebrüder götz and Lechwerke as well as numerous other European, North American and Australian companies. FastStats Discoverer is a data analysis software that allows for quick and efficient data visualizations, customer analyses and customer segmentations. Module extensions allow for additional options, such as creating customer profiles, predictive analytics, or geo-targeting. The FastStats PeopleStage campaign management software gives you a marketing-friendly, user-friendly and intuitive campaign management tool that allows you to easily plan and automate multichannel campaigns. We have been cooperating with the British software provider Apteco since September 2016 in the fields of customer data analysis and campaign management. When selecting a suitable tool, a high level of interface availability and analytical flexibility were decisive factors for us. Our customers profit above all from the simple and fast implementation into their existing IT landscapes and the particularly intuitive user interface. With revenues of over 3 billion US dollars, SAS is one of the largest software producers in the world. SAS Big Data Analytics solutions help companies at more than 80,000 locations worldwide to increase their performance by basing their strategic decisions on accurate information from ever-increasing amounts of data. SAS is presently a global company with customers in 148 countries and millions of users. While SAS has continued to develop, the basic mission has remained the same: to make more out of ever-increasing data volumes than anyone would have ever thought possible and to offer SAS customers significant added value through software solutions. Analytics creates success: Reliable findings. New potential. Faster reactions. Learn about methods, best practices and thought leaders. The SAS Enterprise Guide is a menu and assistant controlled tool that allows users to analyze data and the publish results. Insights from descriptive and predictive models form the basis for better business decisions. 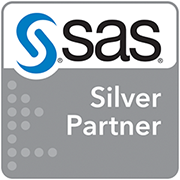 We have been a SAS Silver Partner, with a focus on products for advanced analytics and data mining. The SAS partnership enables us to pass on SAS’s innovative strength in this field (e.g. SAS Viya) directly to our customers. Continuous training allows us to get the most out of your analytical SAS products, significantly increasing the ROI.